ab21990 is raised against the C-terminal region of the Human Otx2 protein. This product is batch tested in Y79 cell lysate, recombinant Otx1 and overexpressed Otx2. All batches should detect endogenous Otx2, overexpressed Otx2 and recombinant or overexpressed Otx1. Synthetic peptide corresponding to Human Otx2 aa 250 to the C-terminus (C terminal) conjugated to Keyhole Limpet Haemocyanin (KLH). This antibody gave a positive signal in the following whole cell lysates: Y79. 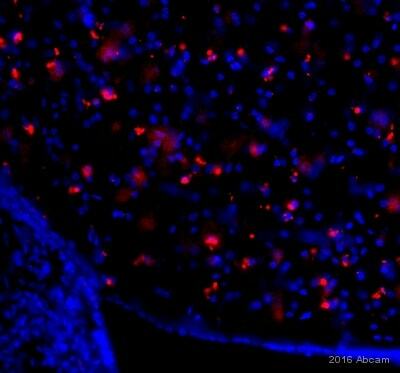 This antibody gave a positive signal in the following cell lines: Human Embryonic Stem cells. Our Abpromise guarantee covers the use of ab21990 in the following tested applications. IHC-Fr Use a concentration of 0.8 µg/ml. ICC/IF Use a concentration of 0.8 - 4 µg/ml. WB Use a concentration of 1 µg/ml. Detects a band of approximately 37 kDa (predicted molecular weight: 31.6 kDa). Function: Probably plays a role in the development of the brain and the sense organs. Can bind to the BCD target sequence (BTS): 5'-TCTAATCCC-3'. Tissue specificity: Expressed in brain. Disease: Defects in OTX2 are the cause of microphthalmia syndromic type 5 (MCOPS5) [MIM:610125]. Microphthalmia is a clinically heterogeneous disorder of eye formation, ranging from small size of a single eye to complete bilateral absence of ocular tissues. Up to 80% of cases of microphthalia occur in association with syndromes that include non-ocular abnormalities. MCOPS5 patients manifest unilateral or bilateral microphthalmia/clinical anophthalmia and variable additional features including coloboma, microcornea, cataract, retinal dystrophy, hypoplasia or agenesis of the optic nerve, agenesis of the corpus callosum, developmental delay, joint laxity, hypotonia, and seizures. Similarity: Belongs to the paired homeobox family. Bicoid subfamily. Contains 1 homeobox DNA-binding domain. Otx1 +2 was immunoprecipitated using 0.5mg Y79 whole cell extract, 5µg of Rabbit polyclonal to Otx1 +2 and 50µl of protein G magnetic beads (+). No antibody was added to the control (-). The antibody was incubated under agitation with Protein G beads for 10min, Y79 whole cell extract lysate diluted in RIPA buffer was added to each sample and incubated for a further 10min under agitation. Proteins were eluted by addition of 40µl SDS loading buffer and incubated for 10min at 70°C; 10µl of each sample was separated on a SDS PAGE gel, transferred to a nitrocellulose membrane, blocked with 5% BSA and probed with ab21990. Band: 37kDa; Otx1 +2, non specific - as present in control (lane 2); 37kDa: We are confident this was due to slight lane contamination and the band seen in the IP lane is our target of interest. Immunohistochemistry (Frozen sections) - Anti-Otx1 + Otx2 antibody - ChIP Grade (ab21990)This image is courtesy of an anonymous abreview. 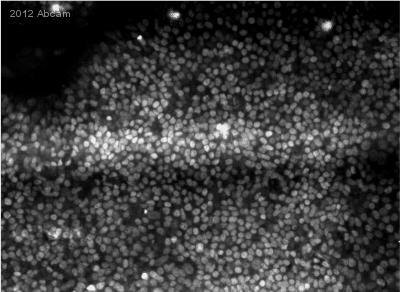 Immunohistochemistry (Frozen sections) analysis of E8.5 mouse embryo brain section labeling Otx1 + Otx2 with ab21990 at 1/300 dilution. The tissue was fixed with paraformaldehyde and permeabilized with PBS / 0.5% v/v Triton X-100. An undiluted donkey anti-rabbit Alexa Fluor® 555 secondary antibody was used. This Otx1 recombinant protein has a GST tag causing it to run at ~74kDa. ab21990 staining Otx2 in embryonic day 14.5 (E14.5) mouse eye by Immunohistochemistry (formalin fixed, paraffin embedded sections). The embryo was fixed in 10% neutral buffered formalin overnight at room temperature, then paraffin-embedded and sectioned at 4µm. Following deparaffinization and antigen retrieval in a rice steamer in 10mM sodium citrate (pH 6.0), the sections were blocked with 5% normal goat serum for half an hour at room temperature. ab21990 was diluted in PBS at 1/100, and incubated overnight at 4°C. The secondary was goat anti-rabbit Alexa®568, diluted in PBS with 1.5% normal goat serum. The mounting medium contained the nuclear stain DAPI (blue). Mouse E6 embryos were sectioned and then fixed in paraformaldehyde. Antigen retrieval was performed using citric acid and the sections permeablized and blocked for 1 hour in serum. Embryos were stained with ab21990 (1/2500) diluted in 10% serum, 1% ovalbumin in PBSTween for 14 hours at 4°C. They were then washed and stained with a goat anti-rabbit biotin conjugated antibody. After using a biotinylated secondary, ABC and then DAB was used for color development. Observed band size: 37 kDa why is the actual band size different from the predicted? 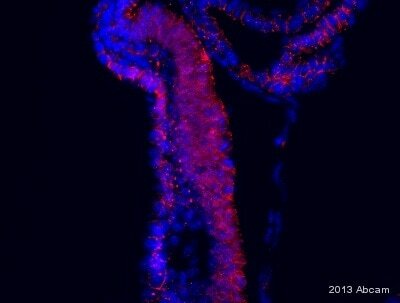 The image shows staining of Otx2 in human embryonic stem cells differentiated into neuroectoderm. As would be expected, staining is nuclear. Publishing research using ab21990? Please let us know so that we can cite the reference in this datasheet. this study, while it is study on Otx2, has not performed any CHIP experiments and has not even used any Abcam Antibody. Chromatin samples were prepared from heads of uninjected stage 22-24 embryos, and imunoprecipitated with either 5 micrograms of control IgG or anti-Otx2 antibody (Abcam, ab21990). I am using this antibody per the recommendation of a colleague, but I am getting very different results using the same protocol and samples. Can I please receive another lot to try? Thank you for contacting Abcam regarding ab21990. Recently, I’ve been in contact with a customer who’s had some trouble with AB74768; I’ve attached their completed troubleshooting form to the email. They’re hoping to get a replacement vial, but of AB21990 instead. I'm sorry to hear that the customer has trouble with this antibody. The information that was provided by the customer is very helpful to us and I am happy to arrange for a free of charge replacement with ab21990. It will be added to our next shipment to you. I have only been using ab21990 the order confirmation number is . Please go ahead and send me ab76748 as a replacement. Thank you for sending time on resolving these issues. Thank you for confirming these details and for your cooperation. The details provided enable us to closely monitor the quality of our products. I am sorry this product did not perform as stated on the datasheet and for the inconvenience this has caused. As requested, I have issued a free of charge replacement with the order number . To check the status of the order please contact our Customer Service team and reference this number. Please note that this free of charge replacement vial is also covered by our Abpromise guarantee. Should you still be experiencing difficulties, or if you have any further questions, please do not hesitate to let us know. I wish you the best of luck with your research. 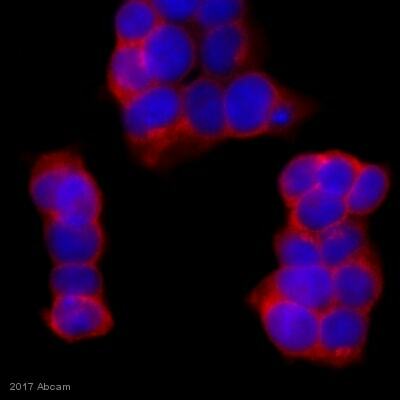 Here is the link to ab92515 ( https://www.abcam.com/Otx2-antibody-EPR3347-ab92515.html) The western has a single band close to the 25kD marker band. While the ab21990 has two bands one just above 25kD and one at 37kD. Since 21990 detects both OTX1 (37kD) and OTX2 (32kD) I assume my lower band is OTX2. But if ab92515 detects both proteins then why don’t we see two bands? Whereas ab76748 that you suggested previously doesn’t have any western images in the datasheet. I am trying to estimate amounts of OTX2 only. And this is important hence all the questions. Thank you for getting back to me with these questions. I have been under the assumption that you havwe been using ab21190 for your experiments, have you been using ab92515 as well?Based on sequence homology ab92515 will recognize both proteins. The absence of a second band in the image is unresolved but may be due to poor separation or extrememly low levels of Otx1 in the sample. Using ab21190 the lower band will be Otx2 which, in either isoform, has a lower molecular weight that Otx1. (http://www.uniprot.org/uniprot/P32243&http://www.uniprot.org/uniprot/P32242).